On November 14, 2013, the U.S. government crushed nearly 6 tons of elephant ivory in a historic demonstration of its commitment to stopping poaching and illegal wildlife trade. The action by the U.S. Fish and Wildlife Service ushered in a new era in elephant conservation. Ivory has a long history as a favored raw material for art—jewelry, statuary, piano keys and other decorative purposes. The commercial market for ivory, however, is the primary reason for the drastic overharvest and near extermination of African elephants during the 20th Century. In response, the world’s nations together made international ivory trade illegal in 1990. Elephant populations have been recovering since then, but a new wave of poaching since about 2010 is driving elephant numbers down again—and bringing a renewed sense of urgency to elephant conservation. Kenya made the first commitment to destroying ivory when it burned its stockpile on July 19, 1989. They burned ivory again in 1991 and 2011, joined by two other countries. But ivory destruction took hold as a global strategy in 2013, when the Philippines and U.S. destroyed their ivory collections. Other countries got the signal. 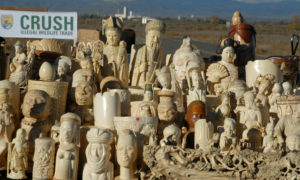 Since then, 16 additional countries have crushed or burned their ivory stockpiles, including China, the largest market for illegal ivory sales. In all, 275 tons of ivory have been destroyed. Twice more, in 2015 and 2017, the U.S. crushed ivory, both times in Times Square, New York City. Unfortunately, confiscated ivory continues to accumulate. Ivory destruction is symbolic, but real actions have followed. The U.S. made virtually all internal sales of ivory illegal in 2016 (only antique ivory and ivory included on musical instruments are exempted). China has instituted policies to do the same by 2018. Actman, Jani. 2016. U.S. Adopts Near-Total Ivory Ban. National Geographic News, June 3, 2016. Available at: https://news.nationalgeographic.com/2016/06/us-ivory-ban-regulations/. Accessed November 13, 2017. Actman, Jani. 2017. Does Sestryoing Ivory Save Elephants? Experts Weigh In. National Geographic News, August 2, 2017. Available at: https://news.nationalgeographic.com/2017/08/wildlife-watch-ivory-crush-elephant-poaching/. Accessed November 13, 2017. Poaching Facts. Ivory Stockpile Burns. Available at: http://www.poachingfacts.com/history/ivory-stockpile-burns/. Accessed November 13, 2017. US Fish and Wildlife Service. 2013. U.S. Destroy Confiscated Ivory Stockpile, Sends Message that Wildlife Trafficking, Elephant Poaching Must be Crushed. USFWS News Release, November 14, 2013. Available at: https://www.fws.gov/le/pdf/Ivory-Crush-News-Release.pdf. Accessed November 13, 2017.